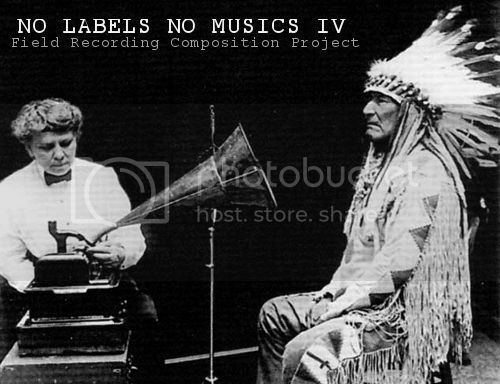 The electro-music/EdP sound collage project No Labels No Musics challenges musicians to create original compositions from the existing field recording archive. Participants will be limited to field recordings as the only sound sources, but are encouraged to chop, mutilate, and process until cooked to desired flavor. 1. Participants use ONLY the field recordings in the ARCHIVE HERE to construct your pieces. If you have your own recording(s) that you would like to use outside of the archive, we ask that you upload your field recordings and add them to the archive. One of the interesting aspects about this project is observing the differences between artists when everyone has equal access to the same source material sounds. More often than not, no two people will use a field recording the same way, especially if processed. 2. Original compositions should be anywhere from 1 to 10 minutes in length. Tracks need to be in FLAC format. 5. Deadline for submission is Sunday January 6th, 2013. 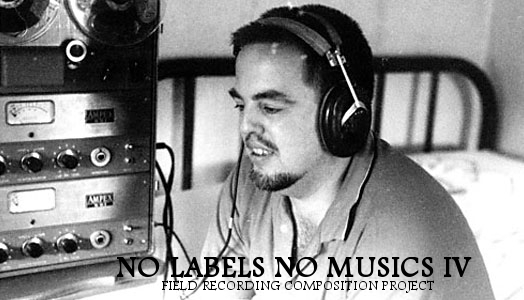 Project will be published under a creative commons license at EdP netlabel with João Ricardo. Thanks João! This is NOT a competition or a contest. This is simply a creative project to explore soundscapes and designs to see what can be carved from this source material. Please post any questions about the project here in the thread. Good luck, have fun, and pleasant composing! yes! i was afraid i had missed the announcement. Completed my track tonight, "Flip the Switch" (10:51). I used Audacity, Ambient v0.3 (A Max/Msp app), and Reaper. If you intend to use Soundcloud to make your track available, please, set it to public. "Sorry if you have been experiencing issues with sharing or receiving private tracks. Unfortunately we are currently experiencing a bug with our private sharing features. This means that tracks which are shared privately are not appearing in users exclusive tracks tab. Our engineers are working hard on fixing this right now and we hope to have this resolved as soon as we can." I'll partecipate to the selection. Very interesting project. BTW I can't see that Facebook page, it always kicks me back to a generic events page. All files were mangled and mixed with CoolEdit. This is interesting ,I think I will have a go. Is it possible to use FX? Such as reverb, delay & pitch (Mainly) Or do we just have to use the source sounds dry? Participants will be limited to field recordings as the only sound sources, but are encouraged to chop, mutilate, and process until cooked to desired flavor. You aren't really missing anything on the FB page, a part from seeing other people that are participating. I mainly created that page as way to draw more people into the project. Yup, as Mefistophelees said above. Just use the field recs as source material, from there the sky (or the universe) is the limit. Sometimes I will process things, then I will reprocess the 1st process and get new sounds out of that.